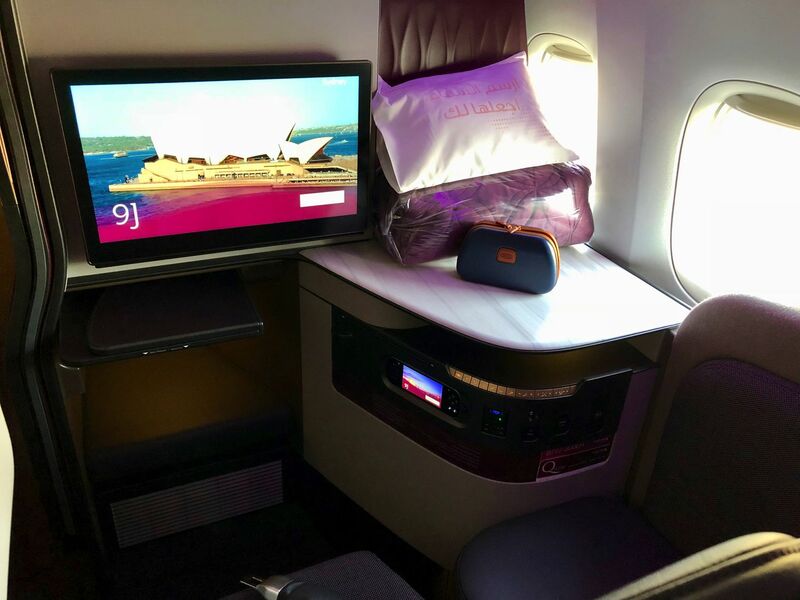 I’m often asked what I consider to be the world’s best business class, and my response comes without pause or qualification: Qatar Airways’ Qsuite. 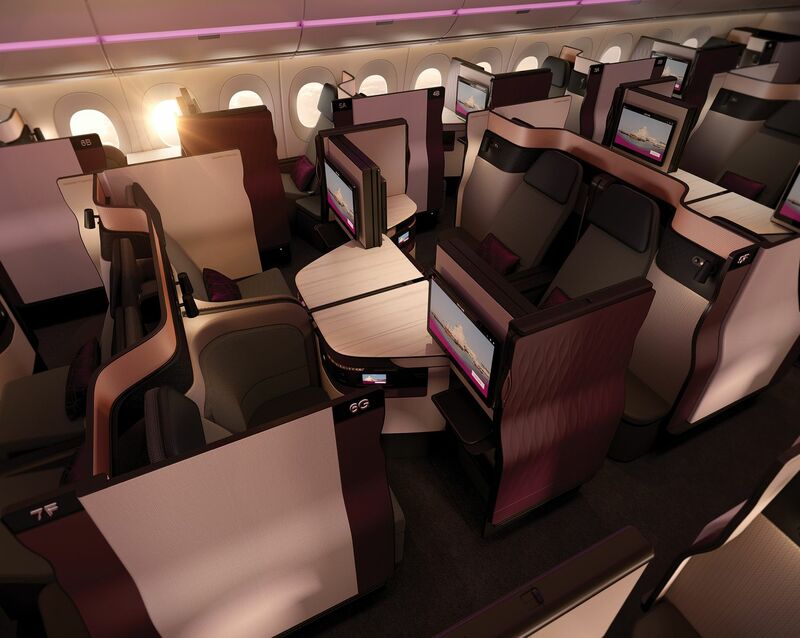 This spacious bespoke suite – created for Qatar Airways by feted UK-based design firm PriestmanGoode – hits a triple-play which no other airline’s business class can match. ... and the ability to have paired middle suites converted into a shared suite with a double bed. More outrageous is that sliding panels can transform two pairs of middle seats into an open ‘quad’ arrangement. But once ensconced in the Qsuite you begin to notice the degree of space, the thoughtful design, the attention to detail and high-quality finishes. 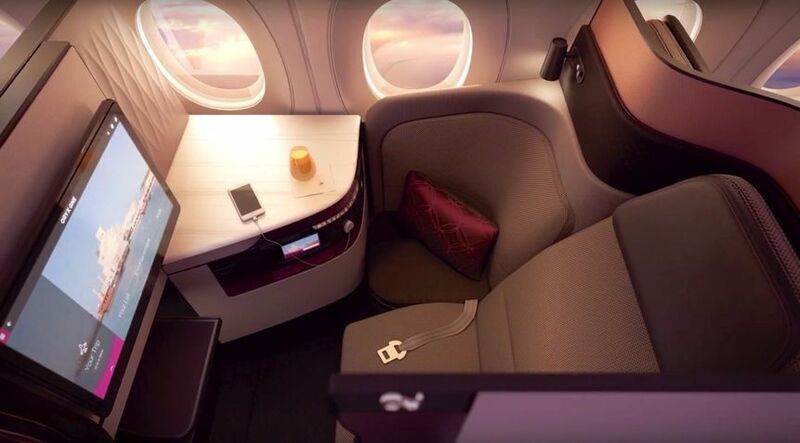 These private suites could pass for first class on many airlines. 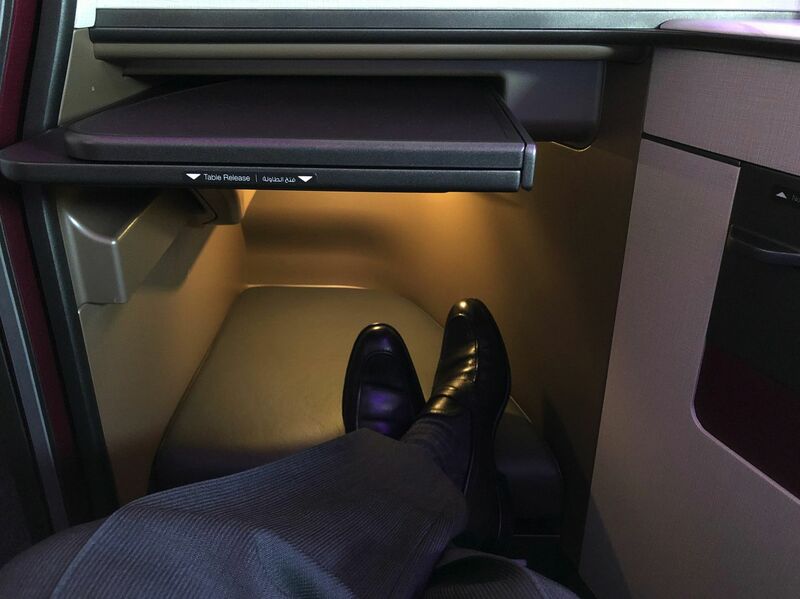 Beyond the seat itself come two other critical factors for the business traveller. 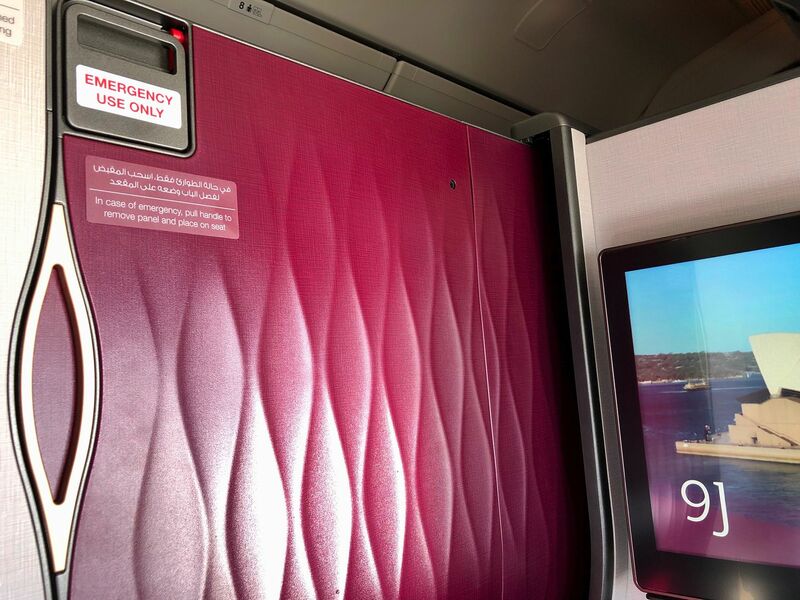 Qatar’s ‘dine on demand’ approach lets you order anything for the extensive menu at any time during the flight – so you can eat what you want when you want, rather than having to sync your schedule to that of the airline. And during those many hours spent getting from A to B in style, the appeal of high-speed Internet shouldn’t be underestimated. 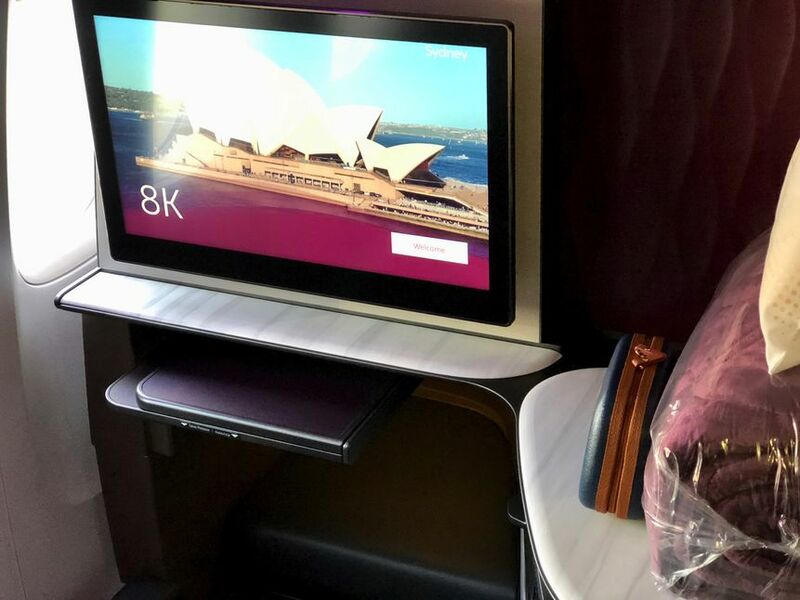 When you pull all that together you’ve got what Australian Business Traveller rates as the world’s best business class, as we discovered during a recent flight from Doha to Sydney on one of Qatar Airways’ Boeing 777-300ER jets. 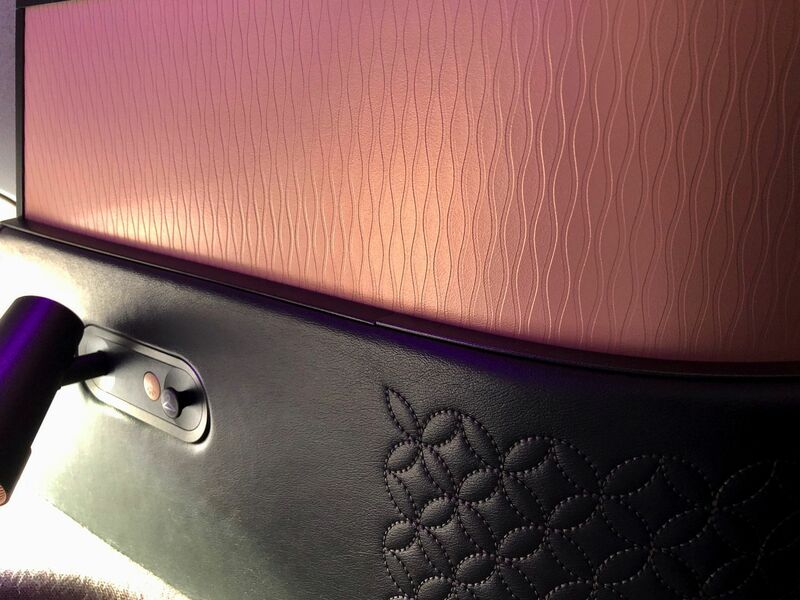 The Qsuites business class cabin is luxurious just to look at. Washed in LED lighting, the colour scheme is built around ‘Qatar burgundy’ offset by satin rose-golds, charcoals, slates and even some marble-finish whites. Each suite’s sliding door is 1.35 metres tall, so they provide ample privacy but still allow the crew to peer over and check in with you as needed. The big question here: how does it feel with that door closed? Do those doors on each suite make for privacy or claustrophobia? Some passengers will no doubt experience a sense of confinement, for which there's an easy solution: leave the door open – although this can sometimes leave you with a view into your neighbour's suite. That said, across the stretch of a 14 hour flight from Doha to Sydney I found the suite doors easy to live with. Whether working, dining, watching a movie or just lazing in the reclined seat, pulling the door closed was the finishing touch in transforming the well-appointed suite into my own little executive crib. To really guarantee sky-high serenity, hit the Do Not Disturb button along the control strip on the edge of the corner console. All the same, during quite a bit of the flight I left the door open. It just felt more ‘natural’ and I always enjoy a bit of interaction with the crew, even as they wander by. If you do think the door might make you feel a bit hemmed in, consider getting one of the seats which face backwards. Yes, backwards. 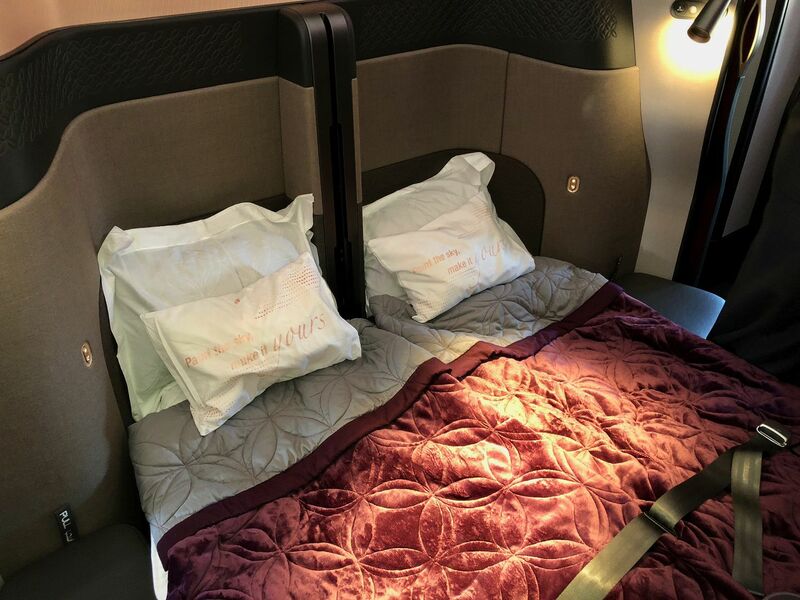 Almost half of the Qsuites face in opposite directions due to the cabin's staggered ‘ying-yang’ layout, as you can see by carefully examining the photo below. 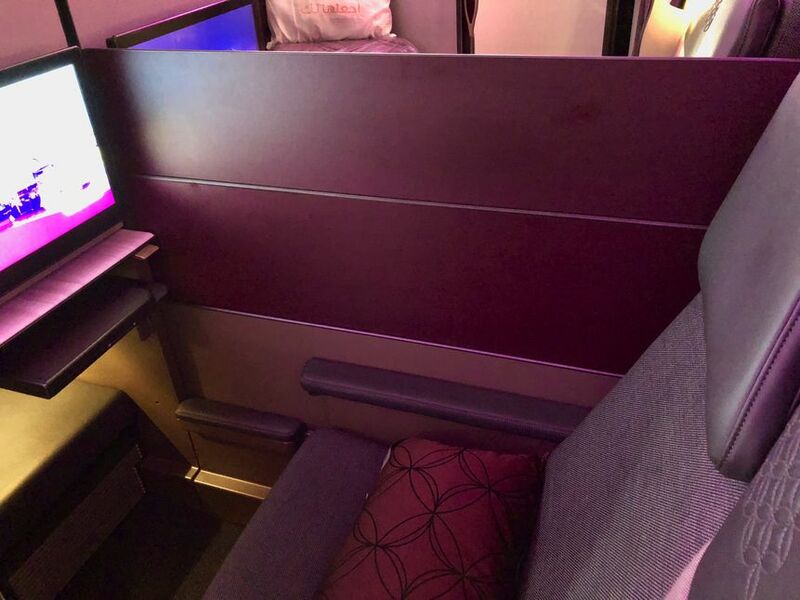 The window seats facing backwards happen to be located directly next to the window, with a wide shelf and stowage compartment between you and the partition and sliding door. The other seats face in the direction of your flight, but put that shelf between you and the window. As a result, it's those backwards-facing Qsuites which provide the greater sense of space and privacy. The paired middle seats also have a similar alternating pattern between forwards and backwards, and having both seats at the aisle or closer to the centre. If you want maximum space and extra privacy but don’t like ‘flying backwards’, there’s a tough choice in your future. But if this is the hardest decision you have to make, life’s not really all that bad! … or that heroic ‘quad’, which opens up four suites. No matter which Qsuite you’re in, the experience is unparalleled and there’s definitely a first class vibe. The Qsuite's seats are wide (55cm, or 21.5 inches) and superbly comfortable, which is just as you’d expect. 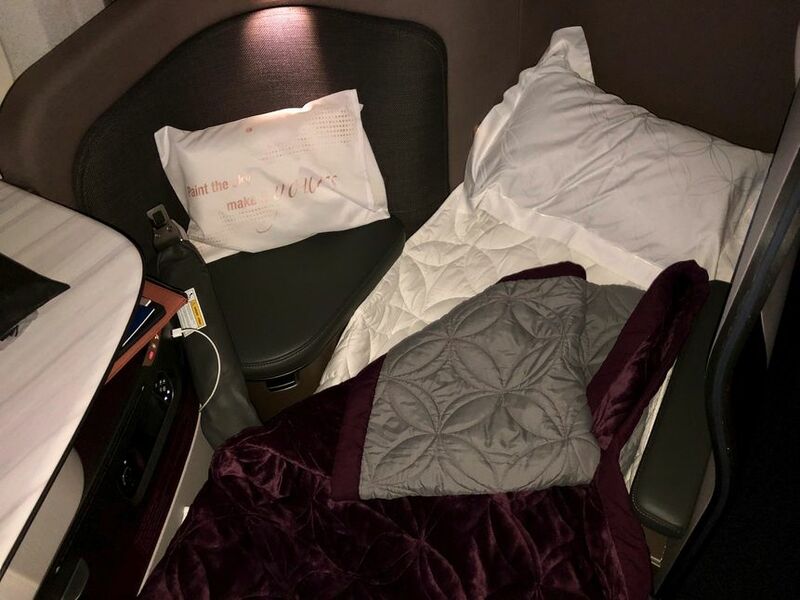 They extend to a 2m (79-inch) fully lie-flat bed, which the crew dress with a quilted mattress pad, plush pillow and a soft blanket with a velvet-like feel, with lightweight White Company sleepwear as the finishing touch. The spacious footwell shows that Qatar Airways and PriestmanGoode not only listened to business travellers, they probably looked at and measured their feet. 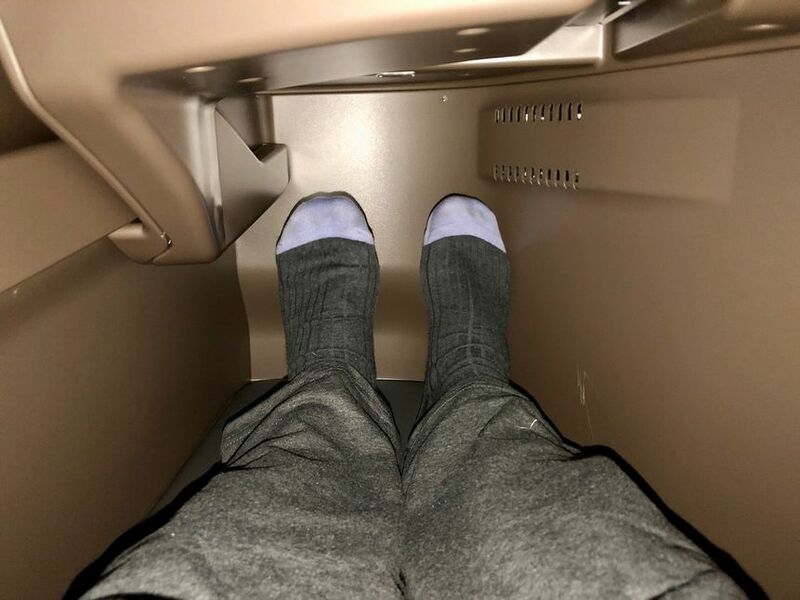 Unlike some of the more restrictive and sometimes vice-like footnooks we’ve seen on other airlines, those of the Qsuites provide freedom of movement for average-sized feet. Facing the seat is one of the largest video screens you’ll find on any flight: a huge 21.5-inch HD touchscreen panel to funnel an extensive movie and TV library of Oryx to your suite. This is paired with a remote control with its own touchscreen display. 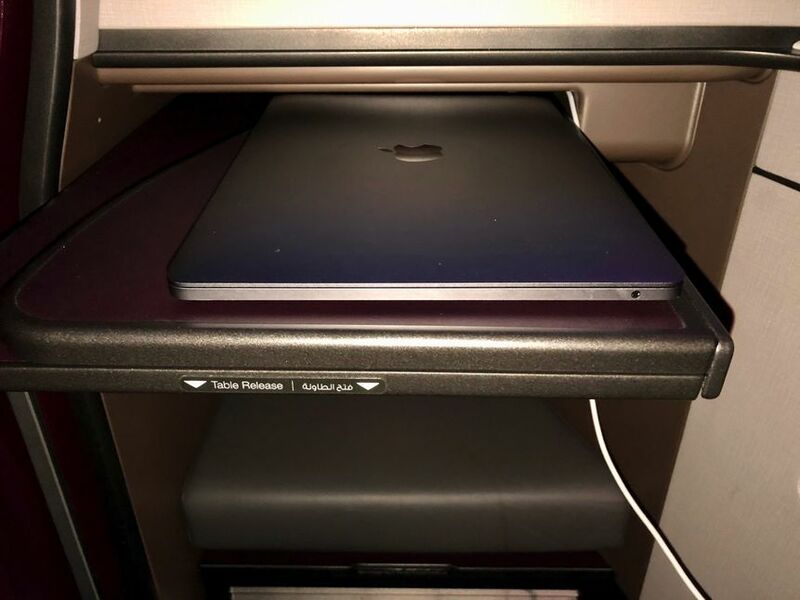 … with more storage space in a recess below (a handy place to tuck away your laptop or amenity kit while keeping the top off the shelf free). 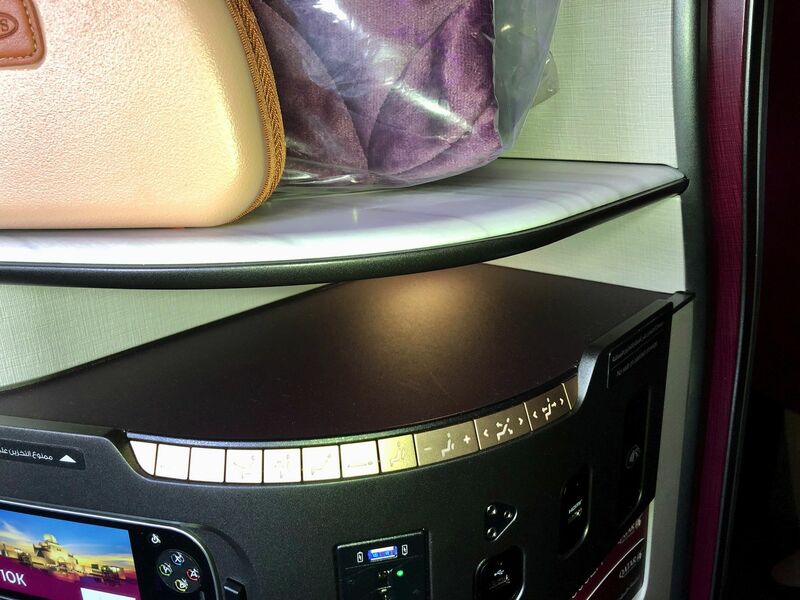 Wrapping around the curved edge of the console is a set of controls for the seat and the suite, including lighting and the Do Not Disturb indicator, with AC and USB sockets below that. 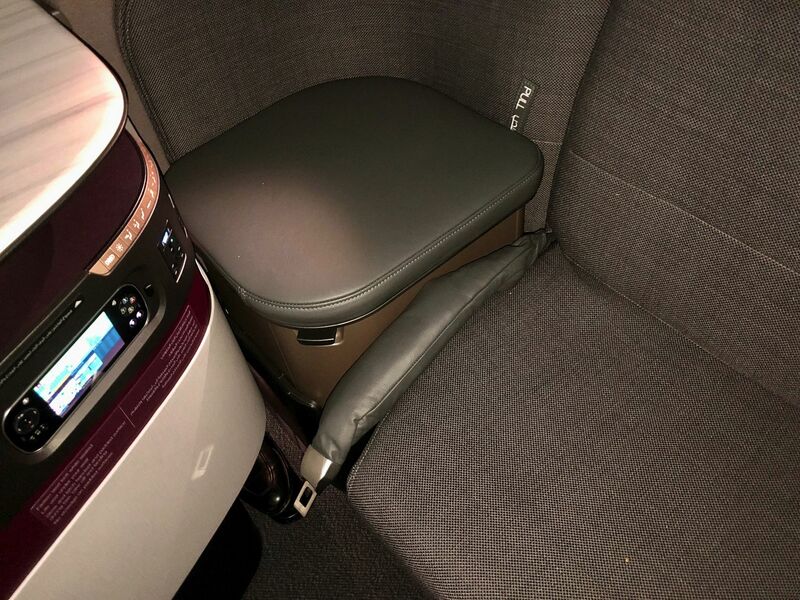 A second place to stow your stuff is under the wide armrest next to the seat. 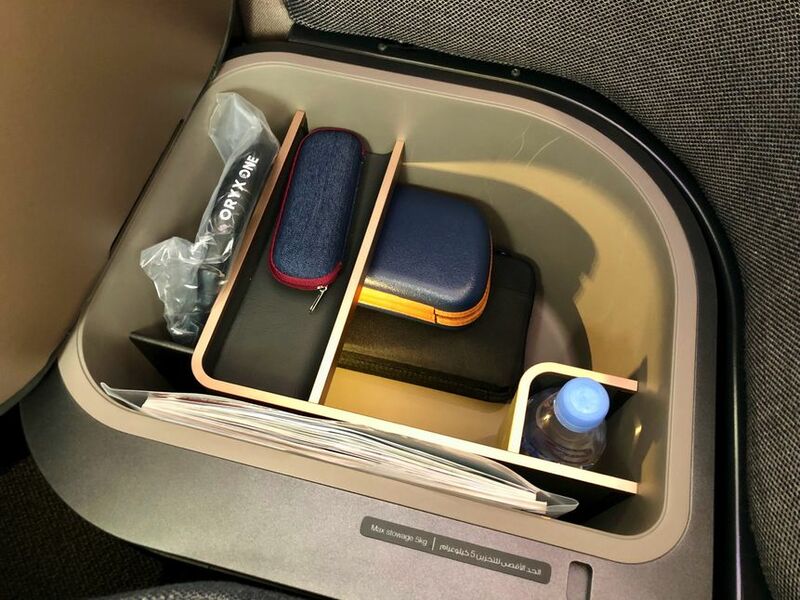 I found the armrest to be a useful surface on its own, but lift the lid and there’s storage for your laptop or tablet, amenity kits and what-not, plus a water bottle pocket and a shelf for smaller loose items such as your reading glasses, watch or smartphone. 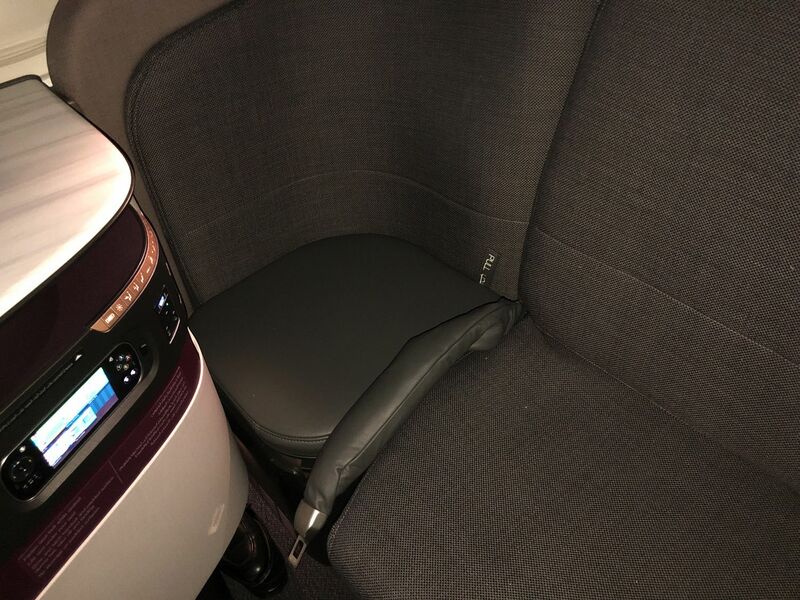 That armrest can even be pushed down to the same level as your seat, so that when you stretch out for a kip there's a little bit of extra space at your elbow. And if you look a bit closer, a bit more carefully, the quality of finish becomes apparent. In the choice of materials, textures and fittings, right down to details such as the detailing on the leather seat, the stitching next to the lamp, the patterns on the seat shells ands walls, even the curve of the tabletop console – every surface and every part of the Qsuite has been carefully considered for unobtrusive elegance, to deliver a premium and undeniably luxurious effect that’s unheard of in business class. 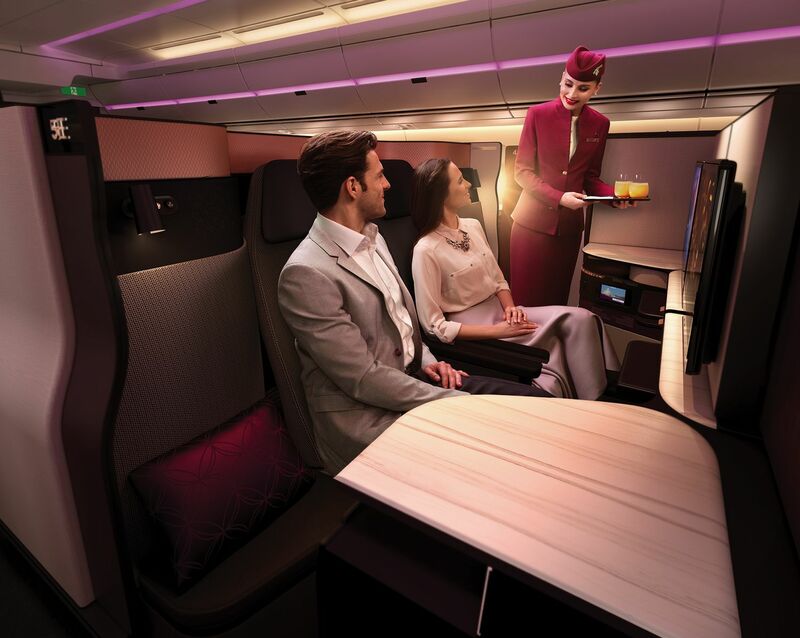 Another key component of the Qsuite proposition is Qatar’s dine-on-demand à la carte meal service, which is available on all international business class flights. The menu runs on for pages and pages – with a seperate ‘snack platters’ menu – and you can order anything you fancy at any time during the flight. Like most business travellers, I’m a staunch advocate of dine-on-demand. I tend to enjoy a main meal in the lounge, especially to get some greens and grains into my system to aid digestion – so the last thing I want to do is to be told that I have to put away another large meal within the first hours of the flight, or I’ll miss out. 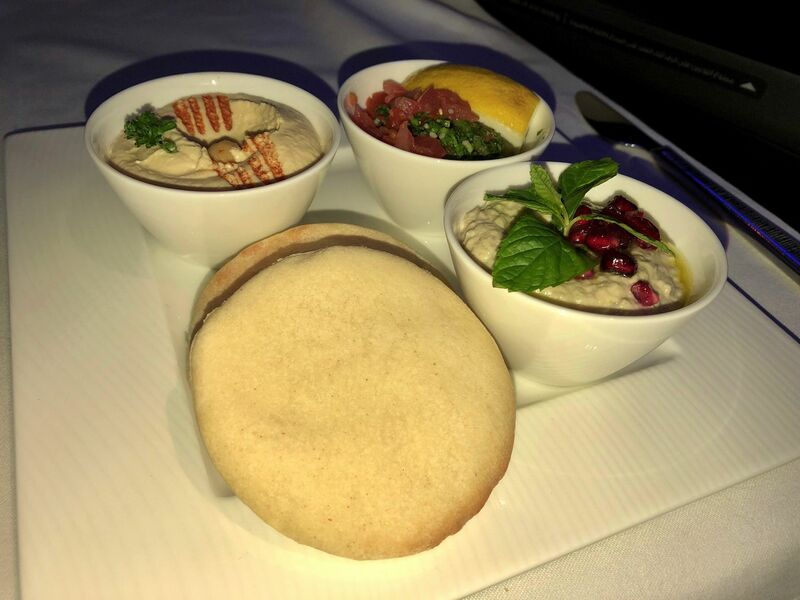 Qatar’s ‘anytime dining’ approach meant that I could graze on a light platter of flatbreads and dips a few hours into the flight, for example, and leave those heartier mains for later – or just graze my way through to sky on several smaller dishes. 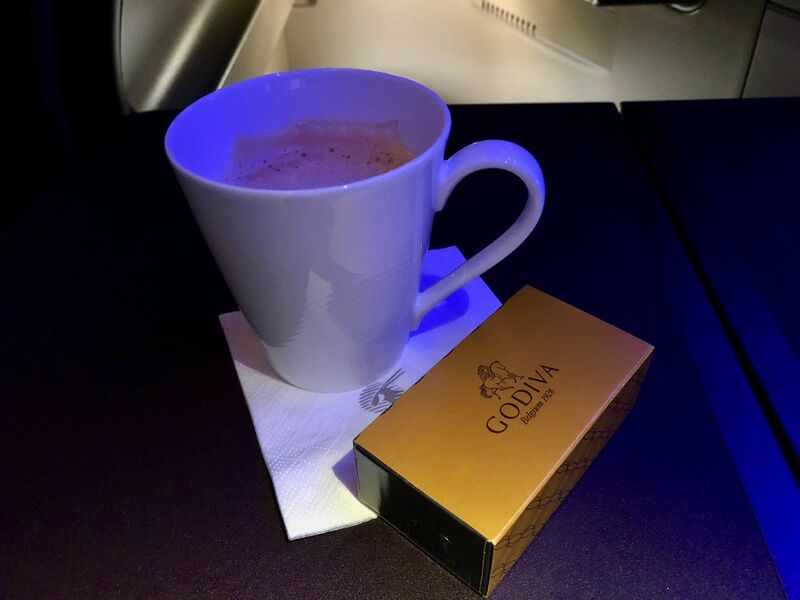 And of course, you can't go wrong with espresso coffee and some Godiva chocolates. 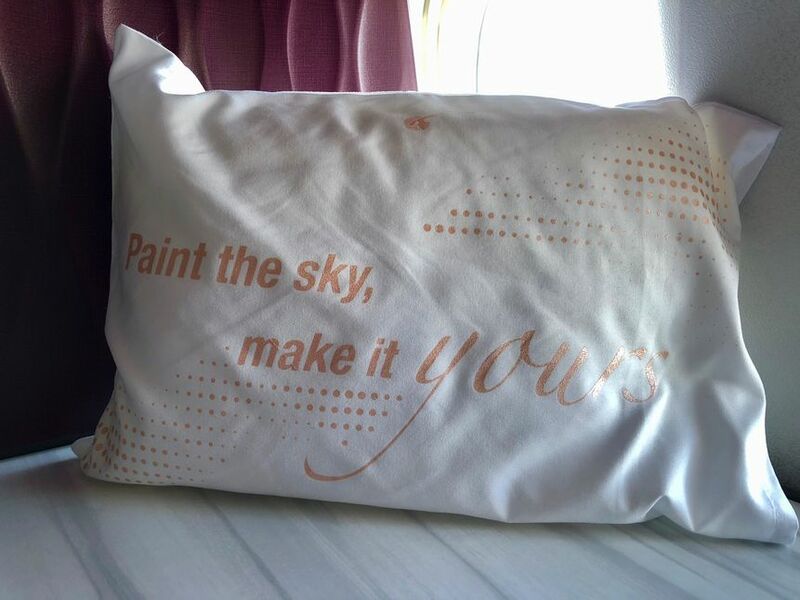 It’s the cabin crew who really make this all work, though. Dine-on-demand places much more of a load on them compared to a set mealtime for the entire cabin, yet on my flight the crew saw to it that every meal for every passenger in my part of the business class cabin was promptly prepared and served. 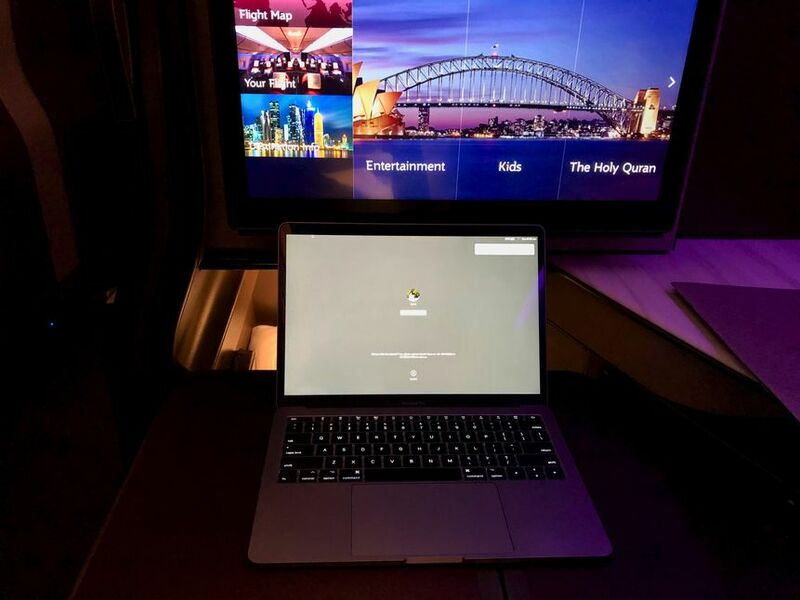 As nice as it would be to turn your Qsuite into a cocoon for a slice of increasingly rare downtime, most business travellers find there’s still some work to be done en route. That’s the job, after all. 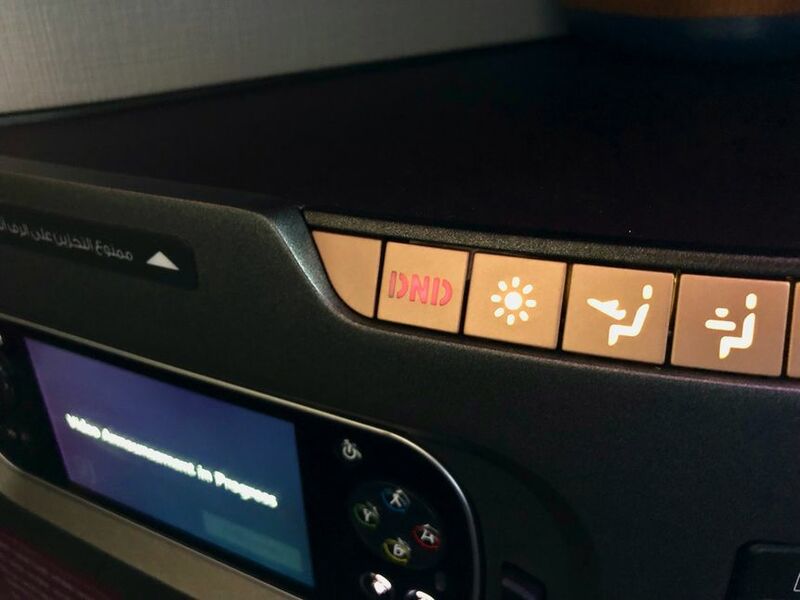 Happily, the Qsuite proves itself to be a superb inflight office suite. 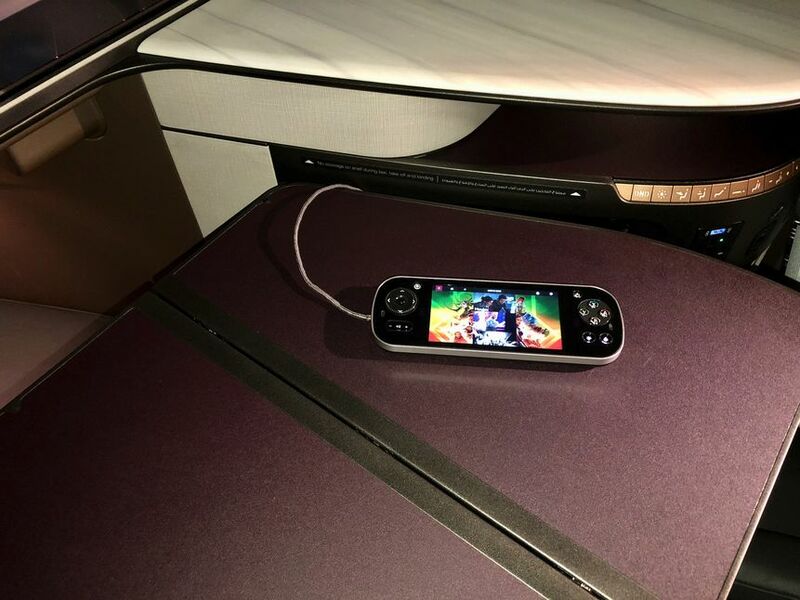 There are AC and USB power outlets, of course – in fact, there are two USB sockets, with the one directly atop the AC outlet being a high-power port with sufficient juice to quickly charge up a tablet or larger smartphone. 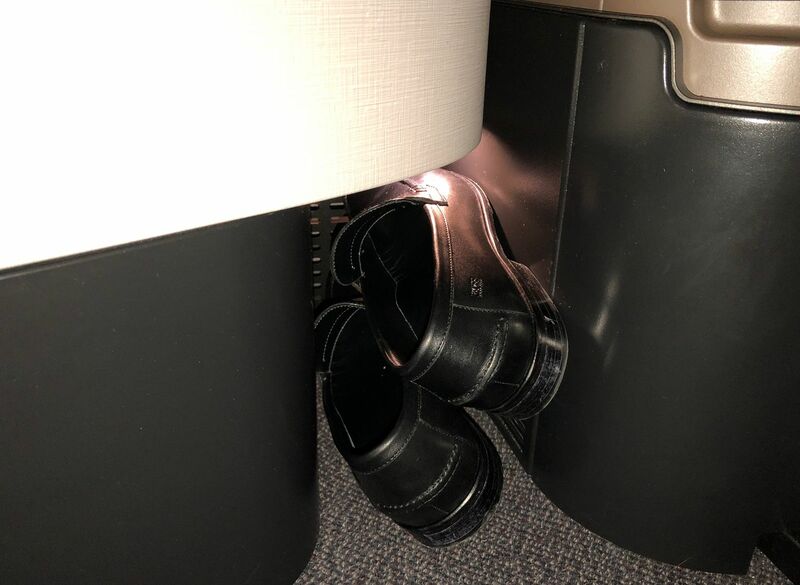 These sockets are all located in just about the perfect position, on the curved edge of the suite’s console/shelf combo. There’s no fiddling around at floor level, nor swivelling around to plug your cables into some port over your shoulder. They’re highly visible and within easy reach. The table which slides out from under the video screen is massive but pleasingly solid and stable, as it’s anchored on both edges – this makes a welcome change from all those tray tables which wobble and bounce as you type away on the keyboard. The table’s split folding design and the gap between it and the housing for the video monitor means that if you need to leave your seat, you can just close the laptop and slide the table out of the way. However, when the table is needed for meals you can easily slip your laptop into that crevice beneath the side shelf. Finally, on my flight the aforementioned Super WiFi delivered a very useable and responsive 5-8Mbps on the download side, which made for zippy loading of webpages and quick dispatch of emails. Those speeds are faster than most international aircraft WiFi and more on par with what you might get at your local cafe hotspot (uploads were more variable, from 0.32Mbps to 5Mbps). Your first hour of Super WiFi is free, with unlimited usage throughout the rest of the flight for just US$10. 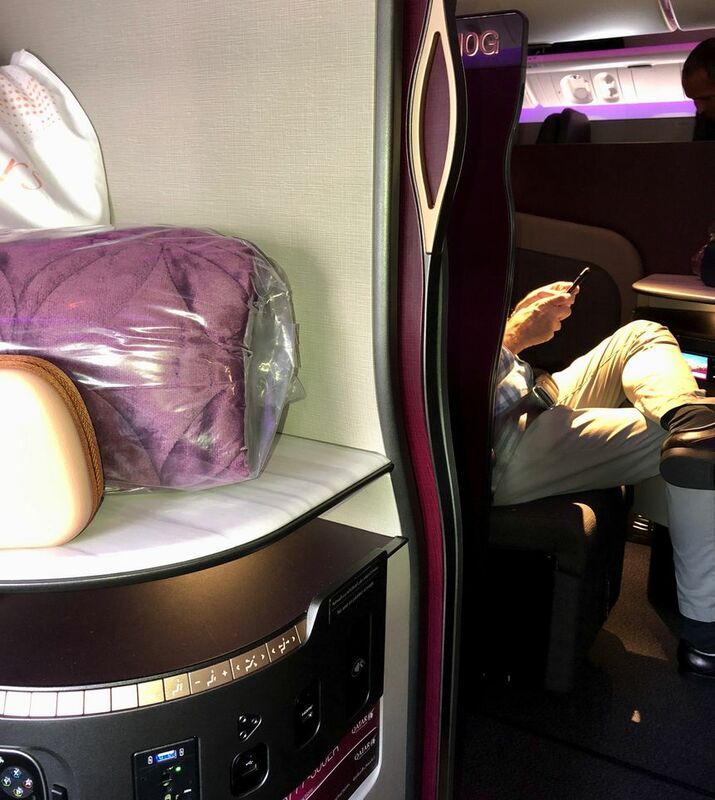 David Flynn travelled as a guest of Qatar Airways. I completely agree. 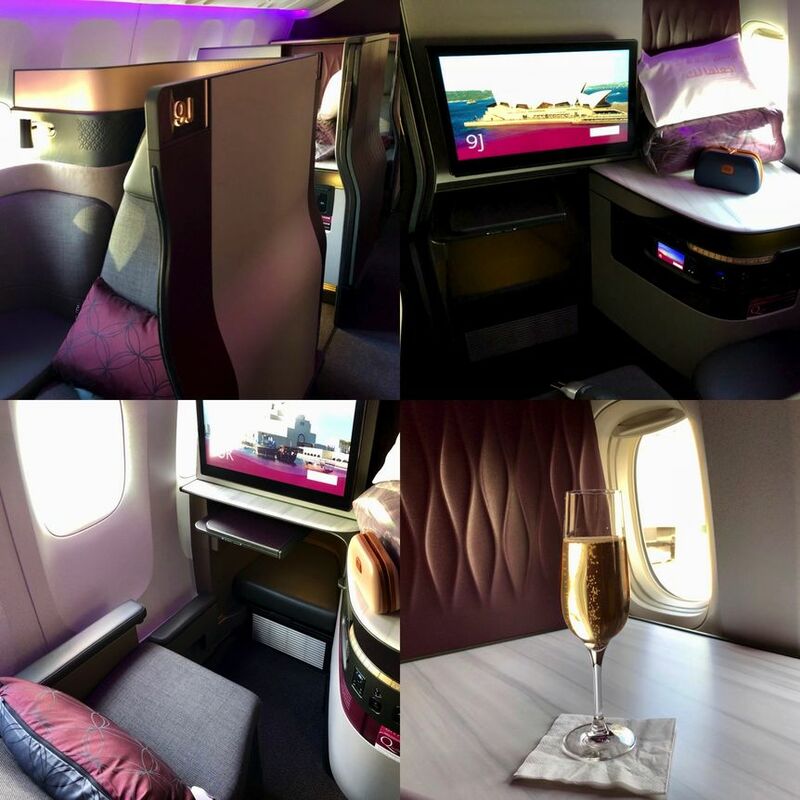 I have flown in the Qsuite from Sydney to Doha and then on to Paris and it is superb, absolutely the best in the sky. You're right to call out "dine on demand" because this is also another winning feature. I also prefer the window suites that put me right next to the window, this makes the suites feel even bigger. Totally agree this is the best Business class in the market. The Qsuite is superb. The menu is extensive and dine on demand is just something else. I might be the only one but I thought dine on demand just meant they loaded like a dinner and a breakfast for you and you could choose when to have them - I didn’t realise it meant you can have whatever you want from the menu in any order whenever you want. Don’t like breakfast? Have another dinner... don’t like the starters? Have 2 mains. Or make a meal out of all the starters. Or whatever. One of my flights had a separate tapas menu loaded with about 8 options in addition to the probably 7 main course options across the menu. The crew on all my flights were excellent and seemed very proud of their service. Only drawback was the 20 minute wait for a shower in Doha, but that’s about it. 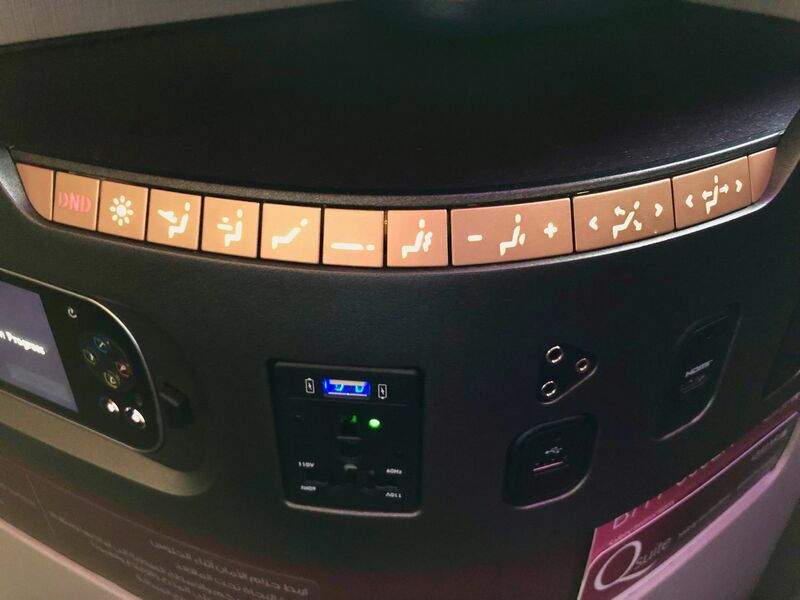 I have never flown Qsuite (it's on my bucket list) but they seem to have ticked every single box, from the seat, privacy, storage and entertainment, to the amenities, service and food. Simply spectacular, and no other carrier has come close. 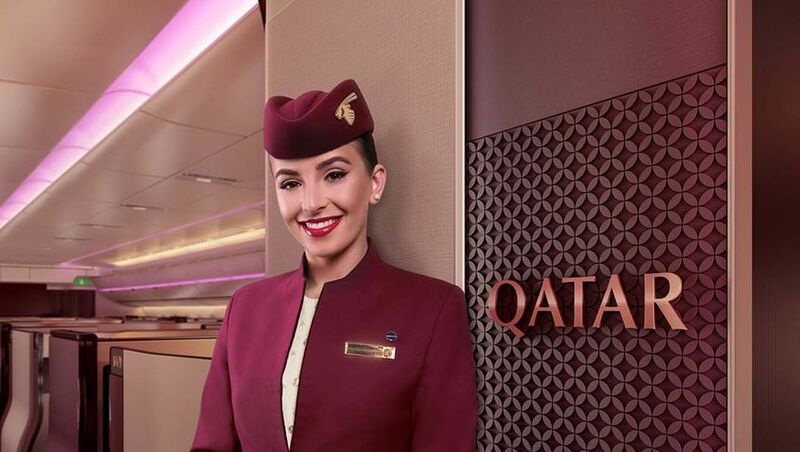 While His Excellency Akbar Al Baker is a controversial figure in the airline industry, he promised before the launch of Qsuite that it would be a super-business class. And that it certainly is. And for this he must be congratulated. Sounds incredible, and now more than a little disappointed that my planned Q suite flight next month DOH-Europe (booked using QF points) has just been downgraded quite significantly to a A330. That’s the biggest downside with QR in my mind; it’s not the first time I have carefully selected a QR flight for the aircraft type/seat to have it changed to an inferior product at a later time. Yes, it can and does happen on any airline, but based on my limited experiences with QR, it happens more than some, and the difference in J hard product between the best (Qsuite) and worst (eg A330!) is quite significant! Have done a few flights on Qsuite now and overall it is excellent. I found the seat in fully flat bed mode left my feet feeling like they were higher, so a slight incline was necessary. A colleague also found similar - curious if anyone else experienced that? Was your seat facing forward or backward? 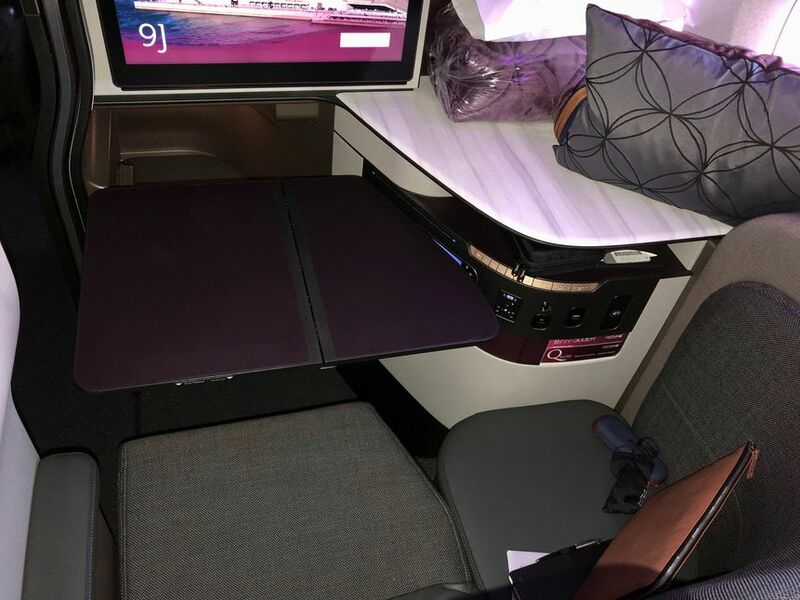 I assume the former - I often find forward-facing flat-bed products make my head lower than my feet (likely a product of the planes's slightly 'nose up' attitude when cruising), necessitating an adjustment of the backrest to avoid blood rushing to one's head. I have not found this to be such an issue when facing backwards, and thus prefer these seats. Certainly does sound like the best out there. The only issue would be facing backwards, but I suspect that is just a psychological thing and, in reality, you don't really notice it. Anyone with first hand experience? 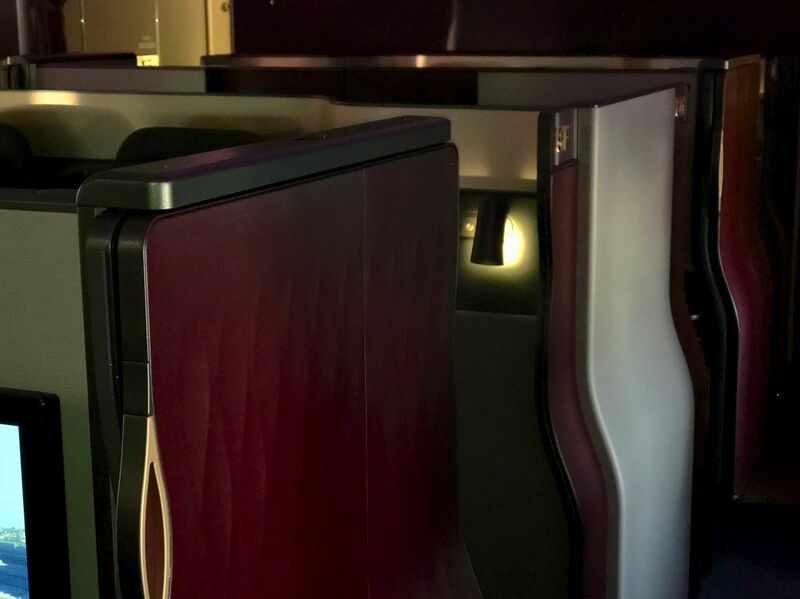 I've flown 'backwards' on the Qsuites and in BA's Club World business class and it doesn't faze me at all, although it is a smidge odd during taxi, take-off and landing – but think of it as a novelty! Completely agree David. Although that is where any similarity with BA’s club world offering ends!!!!! Was not a problem in Etihad first. Hardly noticed it. 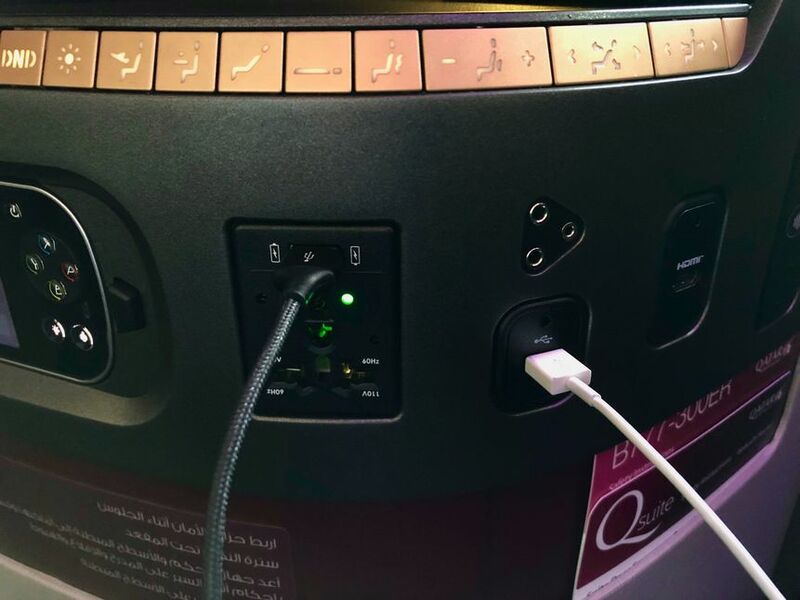 Readers are reminded to keep their comments on topic (ie Qatar Airways' Qsuites business class) and to ensure those comments add value to this article and the overall conversation. 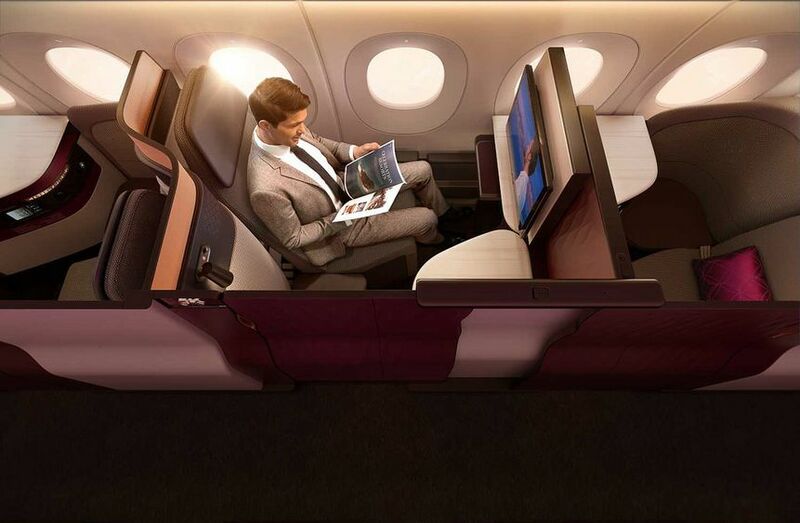 Not sure if they can note a lot of things, since this business class is patented only to Qatar Airways. 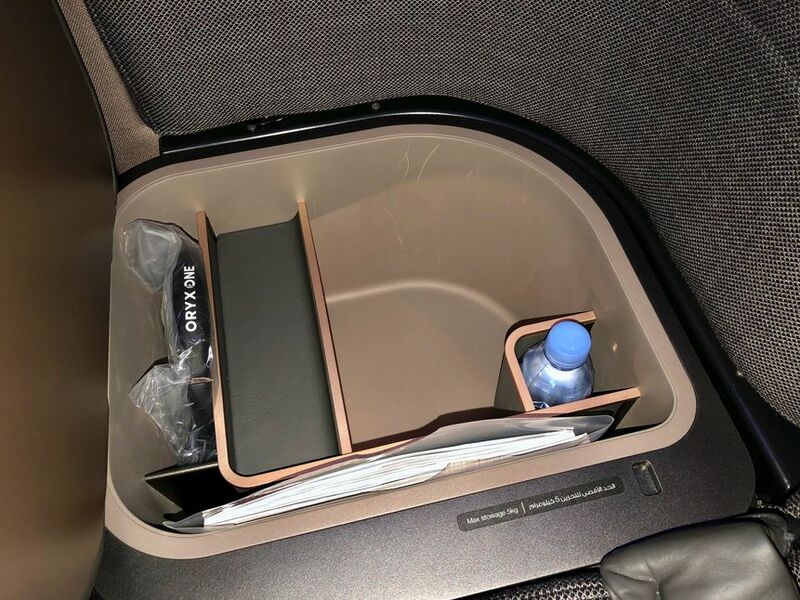 True, other airlines and seat manufacturer's can't do a 1:1 knock-off of the Qsuites, but the concepts, overall design principle and attention to detail is something they could all learn from and implement their own way. Only complaint about the dine on demand is the noise of cutlery on plates and cups while trying to sleep - first world problem I know but having recently endured a LHR-DOH overnight flight one row behind a couple who probably ate their way through the whole menu during the flight, maybe plastic cutlery could be a consideration... otherwise, definitely best J seats in the sky! Fair points overall Joe, except I think their F is superb. Can I redeem.seats using Qantas points ? 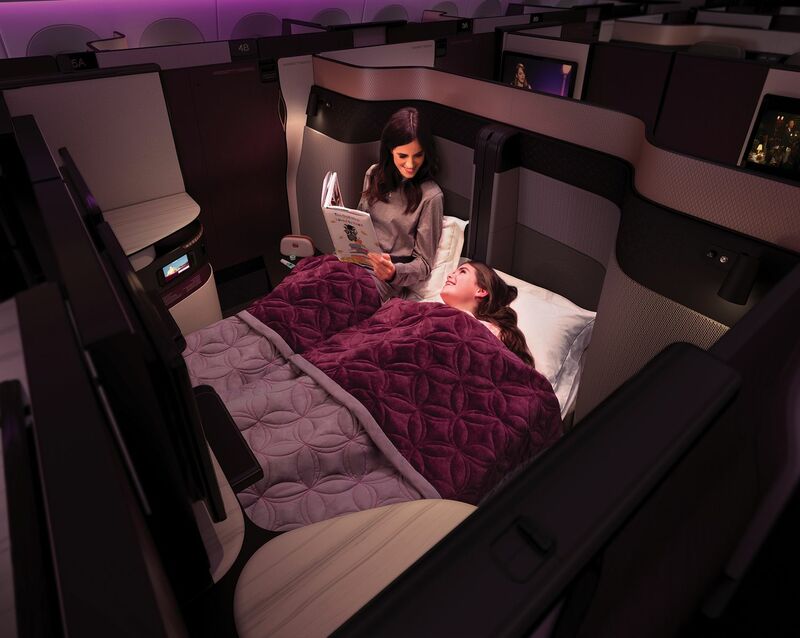 It's a rolling upgrade – right now it's now all Airbus A350-1000s plus some Boeing 777-300ER jets and will also be on new deliveries of the A350-900s. There's no more detail than that, and obviously the number of aircraft with the Qsuites will increase from month to month. Wonderful Stuff David! 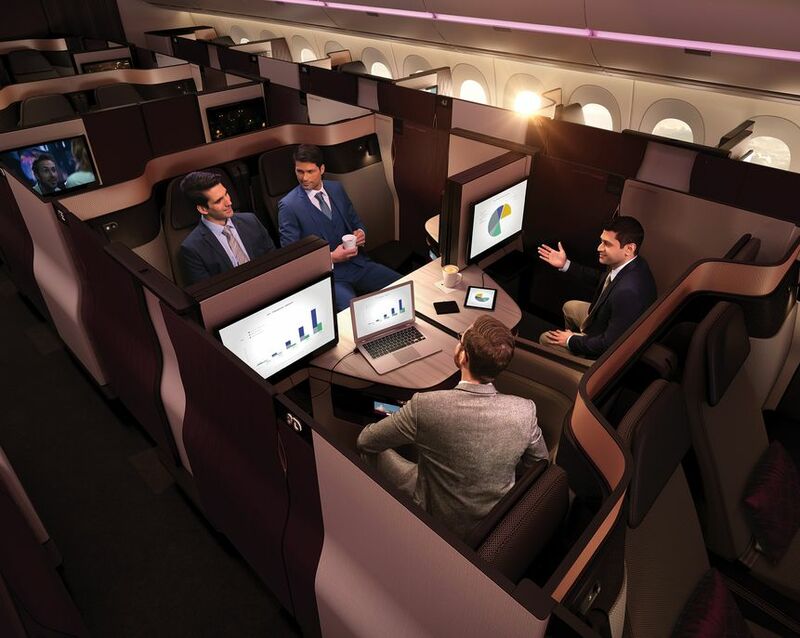 I note this comment, 'The Qsuite is currently being rolled out across Qatar Airways Boeing 777-300ER and Airbus A350 fleets, including the Boeing 777 which runs daily on the Canberra-Sydney-Doha route along with onward European flights from Doha to London, Paris and Frankfurt.' Do we know if NYC has come into play yet? It has, and Washington DC, Singapore and Hong Kong as well - that list above was just to focus on the European destinations which are the most likely routes for Australian readers. Very kind of you David, sincere thanks. The hike to NYC just got a little more choice. SQ, EK or QR. Cheers! 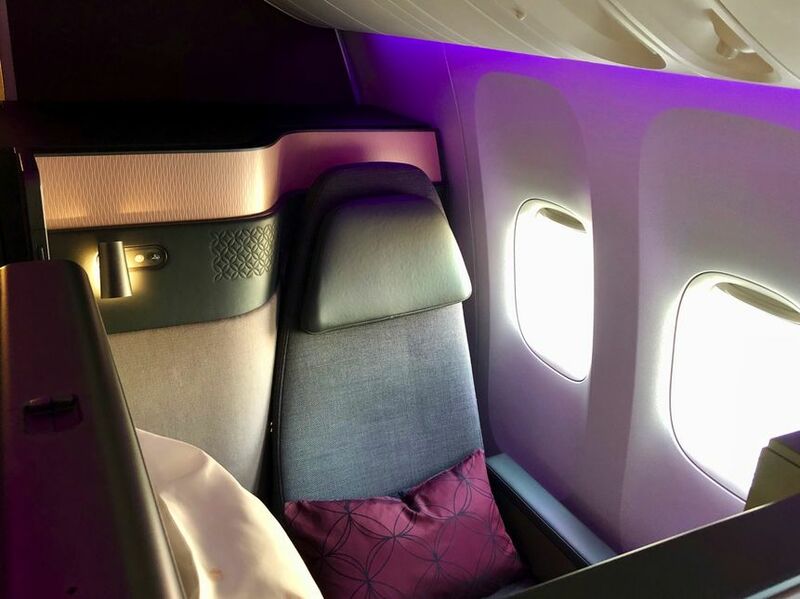 We are booked for Canberra NYC in May - booked a few months ago and at that point not all the New York - Doha (and vice versa) planes were Qsuites. We have ended up with 3 Qsuites and one normal J, although of course that might change by the time we fly. Really looking forward to trying Qsuites. I'm intrigued as to how they manage the logistics of dine-on-demand from an extensive menu. 2. You can't do 2 x double beds in a quad – have a look at the pic below, which shows a 'family' setup: the two seats at the right are side-by-side and thus can be turned into a double bed, the two seats at the left are apart from each other and so would only be single beds. One double and two singles works perfectly for a family! I have never been a fan of "doors", but then I have never flown in a QSuite. Obviously worth trying! Thanks. Sorry, I meant to add that I agree re dine-on-demand re noise. On my last flight I think the five or so people around me seem to take turns, so over a five/six hour flight it was almost constant! David,are there plans to add the QSuite to the A380 fleet? Great review, thanks. Have travelled in Q suites three times this year (backwards all the way!) and the same again for QF A380 J. There is simply no comparison. Even the Qatar lounge at CDG far surpasses the QF First Lounge in Sydney. Thanks David,The quiet cabin of the 380 and the QSuite will be a great product! Loved the dine-on-demand idea, as I was able to split my dinner into two sessions. If travelling out of Heathrow in the afternoon, recommend arriving early and having lunch at their fantastic club lounge. Also appreciated the huge lounge in Doha. Hard to obtain award flights on Qatar though. I completely agree. 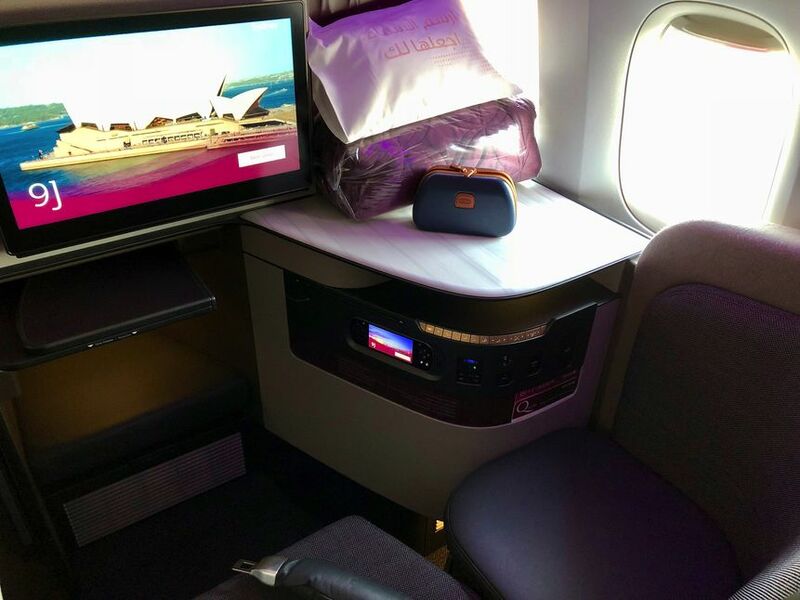 I have flown in the Qsuite from Sydney to Doha and it was fantastic. 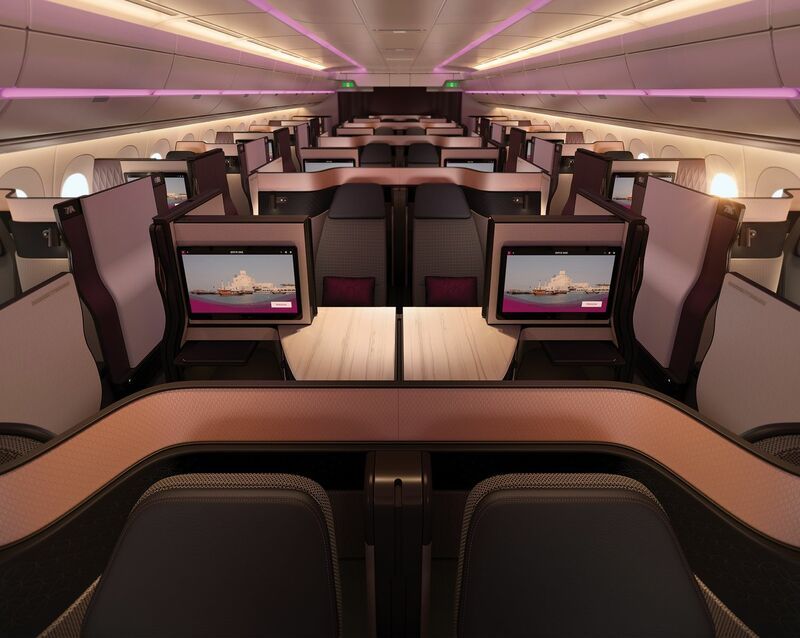 Hello - can I use QFF points to book seats with Qatar? Agree these look fab , I have flown Qatar Business a few times and they are good, But their Loyalty club is useless, try booking a Qantas flight with their points , they either dont come back to you or do one one booking and then forget to book my wife , so you then miss out as they are so slooooow at responding if they do respond at all. I am not sure if it worth it for the seats unless the price is right. 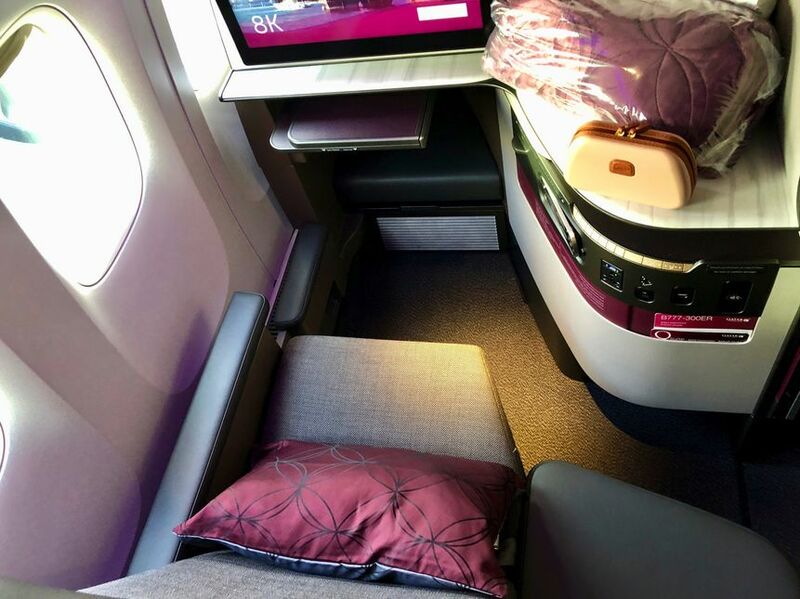 QR Biz is the absolute gold standard for Business Class. I've done the Qsuite to Doha which is fantastic, but even their regular biz on the 380 is also second to none. The best thing about it is how consistent the service is. Their crew training must be world class. Re done on demand - They manage it very well due to the crew complement they have. On a 777-300 they have 16 crew - 8 work in Business and 8 in economy. It’s the crew to passenger ratio that allows it. 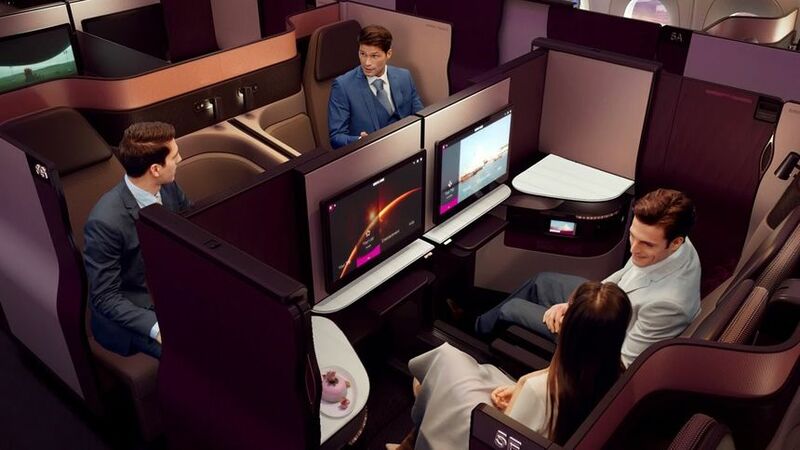 Next time you fly QF or BA or even SQ ask for many F/A’s they would get for a 40-odd seat business Class cabin. It’s likely half the amount. For those who have travelled in the Q suite backwards, is it comparable to riding backwards in a Sydney train? I really hope not. Second, is there a way to find out which routes the Qsuites are on, on an ongoing basis? No it’s nothing like being on a train facing backwards. There is no sense of movement. At night or with the window shades down there is zero difference to facing forwards, and even in daylight with the window shades open, in cruise the scenery is moving by at such a sedate pace that you really don’t notice any difference. The only time you notice it is on takeoff and landing, not bad just a different sensation. What’s wrong with riding a trains backwards? Seems only Sydney spiders have a great issue with it. The rest of the world manages quite well. And to be at least in topic not flown QR but have flown BA facing backwards and apart from an odd sensation on take off there is little difference. Have also flown backwards in a Qantas Dash8-300. That was a bit stranger but ok too. Booked to travel on Qsuite last Tuesday, selected the seat (facing backwards for the extra privacy), checked in online. Really looking forward to it. Then boarded the plane to find it substituted for old config 2x2x2. Very disappointed. Seems like they can substitute at short notice so no guarantee. The article says it all, not just because the reviewer was a guest of Qatar, but because its the unquestionable truth. 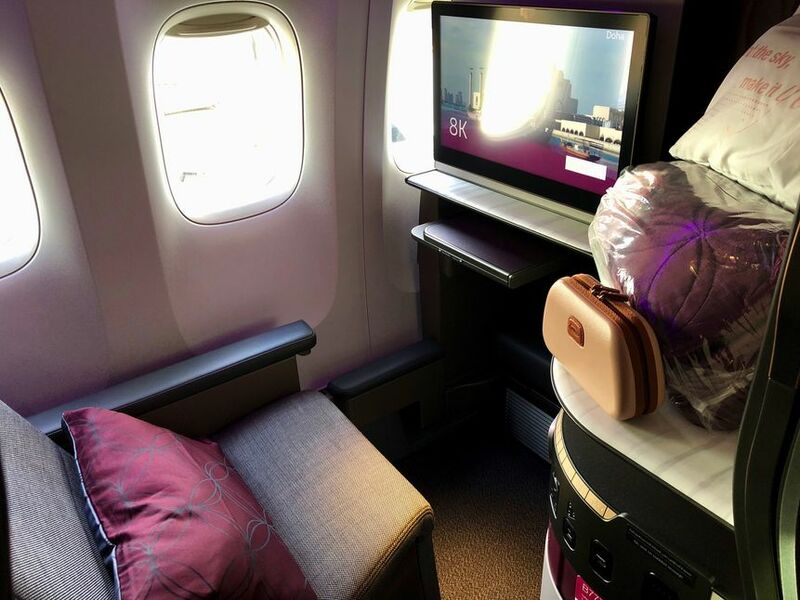 Having flown long ad short haul business class with many of the big airlines, I recently flew Qsuite from Perth to Edinburgh via Doha on points. The experience of a lifetime. Both legs of the flight were exceptional in all regards. I arrived feeling fresh, relaxed and able to easily slip in to the local early afternoon time zone. The lounge in Doha wasn’t obvious but plenty guides to point you in the right direction - be prepared for multiple boarding pass checkpoints before getting into the very large spread out lounge. Be warned though. THEY DO NOT DO BOARDING CALLS. So, it’s up to the traveller to monitor their own time. I only discovered this when, with only a Short 2 hr stop over, I hadn’t heard my flight called, then realized I hadn’t heard any flights called. Started making my way to the gate, a reasonable walk, but staff were already trying to locate me. I really just made it’. In the process, I also discovered that the lounge is HUGE, lots of nooks and crannies, many refreshment stations and a restaurant. I cannot praise the flight crew highly enough. Each one made you feel special. Not just a select few but the few passengers I spoke to said likewise. Simply the best. In the last month I've flown Qatar biz in a 380 followed by a backward Qsuite in a 777, then Emirates 1st, Cathay Pacific biz and Qantas biz. So had an opportunity to compare. Qatar is just amazing, Emirates 1st is just that. I felt Cathay were average by comparison two Qatar and as for Qantas... Seriously? If you had a choice you'd never book them, especially at the rates they are asking. Qantas have no idea when it comes to polish & refinement. Their style appeals to the RM Williams brigade; solid, very expensive but unfortunatley plain and bland. Qatar have perfected every aspect of premium air travel (in the air at least). I also think Emirates First is the standard. And I find nothing wrong with that at all. I find the over the top service offered by many to be more off putting. Personally, I'm not keen on the door being closed even in a window seat. The seat is however, IMO, one of the most comfortable J beds around. This is my next flight for sure !! A pity that I cannot put my iPad screen through the TV as a mirroring like I can at home. It looks to me that Qatar are going to be flying at 100% capacity in Business if you ask me. Fantastic product. Terrible customer service. 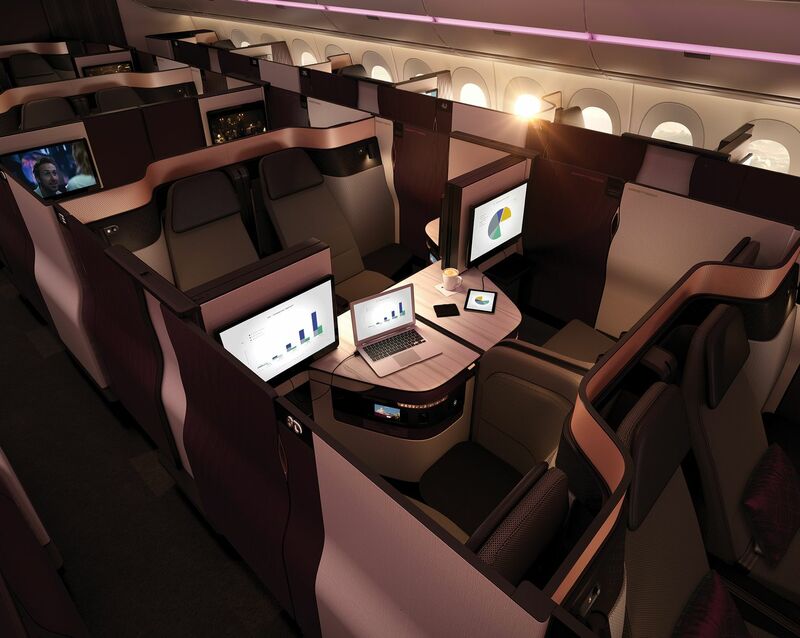 Comment on "Review: why Qatar Airways' Qsuite is the world's best business class"